← Healthy Cruising: What to know before you go? If the unexpected happens during your holiday and you make a travel insurance claim, you may need to pay an “excess amount” when your claim is approved. 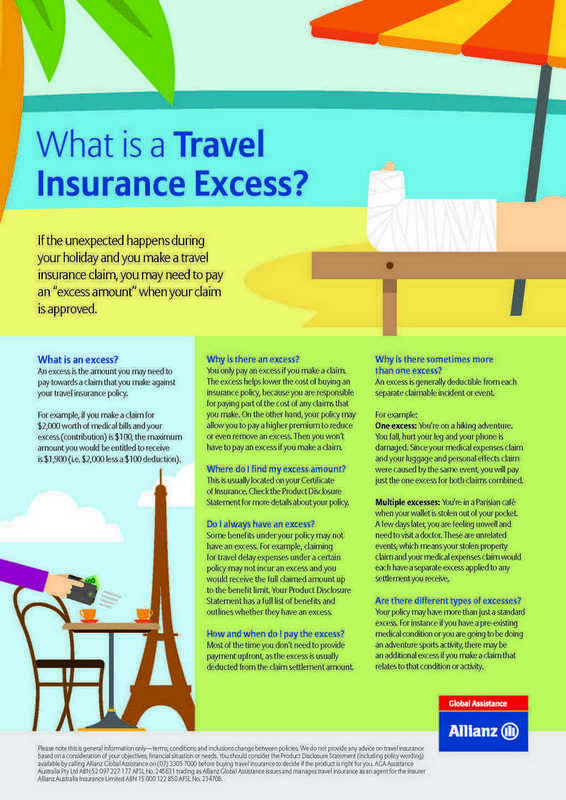 An excess is the amount you may need to pay towards a claim that you make against your travel insurance policy. For example, if you make a claim for $2,000 worth of medical bills and your excess (contribution) is $100, the maximum amount you would be entitled to receive is $1,900 (i.e. $2,000 less a $100 deduction). You only pay an excess if you make a claim. The excess helps lower the cost of buying an insurance policy, because you are responsible for paying part of the cost of any claims that you make. On the other hand, your policy may allow you to pay a higher premium to reduce or even remove an excess. Then you won’t have to pay an excess if you make a claim. Where do I find my excess amount? This is usually located on your Certificate of Insurance. Check the Product Disclosure Statement for more details about your policy. Do I always have an excess? Some benefits under your policy may not have an excess. For example, claiming for travel delay expenses under a certain policy may not incur an excess and you would receive the full claimed amount up to the benefit limit. Your Product Disclosure Statement has a full list of benefits and outlines whether they have an excess. How and when do I pay the excess? Most of the time you don’t need to provide payment upfront, as the excess is usually deducted from the claim settlement amount. Why is there sometimes more than one excess? An excess is generally deductible from each separate claimable incident or event. One excess: You’re on a hiking adventure. You fall, hurt your leg and your phone is damaged. Since your medical expenses claim and your luggage and personal effects claim were caused by the same event, you will pay just the one excess for both claims combined. Multiple excesses: You’re in a Parisian café when your wallet is stolen out of your pocket. A few days later, you are feeling unwell and need to visit a doctor. These are unrelated events, which means your stolen property claim and your medical expenses claim would each have a separate excess applied to any settlement you receive. Your policy may have more than just a standard excess. For instance if you have a pre-existing medical condition or you are going to be doing an adventure sports activity, there may be an additional excess if you make a claim that relates to that condition or activity.